Hope you ride the gravy train over the turkey terrain to Mount Mashed Potato. May your pies pile up to the skies. Grateful for my family, friends, and followers… oh and grateful there’s no rationing of sugar and flour. (Cookie cutter Bed moulding from Truly Mad Plastics , gold background stencil Killer Zebras, ‘give thanks and sweet as pie stencil from The Cookie Box). My sister has been hosting Thanksgiving for untold number of years and it it is my God given duty to bring cookies for the dessert table. Usually, that table is quite full so this year I made turkeys just for the kids (by that I mean mentally a kid so it qualifies a few more folks than you would think). These cookies combined The Cookie Architect designed wave cutter with a small candy corn cutter (both found at the wonderful Truly Mad Plastics web site.) The colors utilized were Americolor egg yellow, orange, chocolate, and sky blue (each icing batch had a drop of egg yellow gel to balance all of the hues). Oh yeah. And one of the turkeys is not like the others. Getting my Sesame Street on. 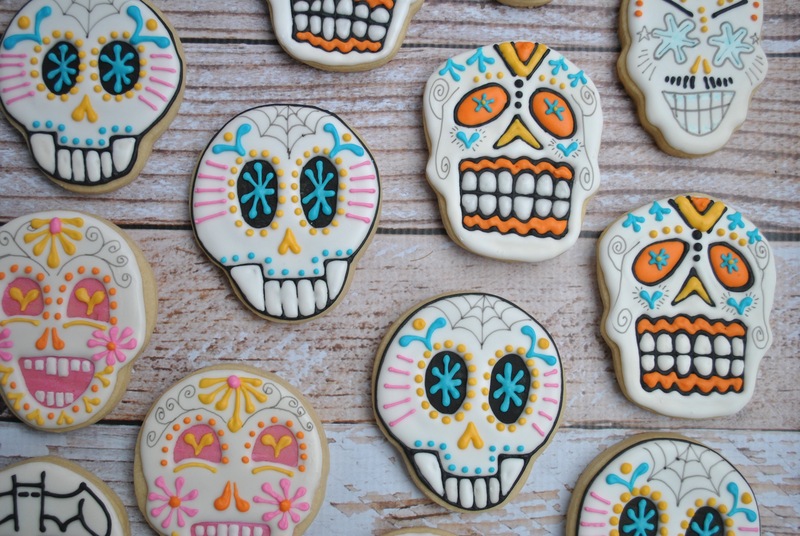 Mexico celebrates the Day of the Dead November 1 and 2. It is a joyous celebration to honor deceased loved ones. Many people create altars that include marigold-like flowers, photos, candles, food and drinks. Often families will stay up all night at the gravesite, telling funny stories about their ancestors, socializing, listening to songs from strolling musicians. 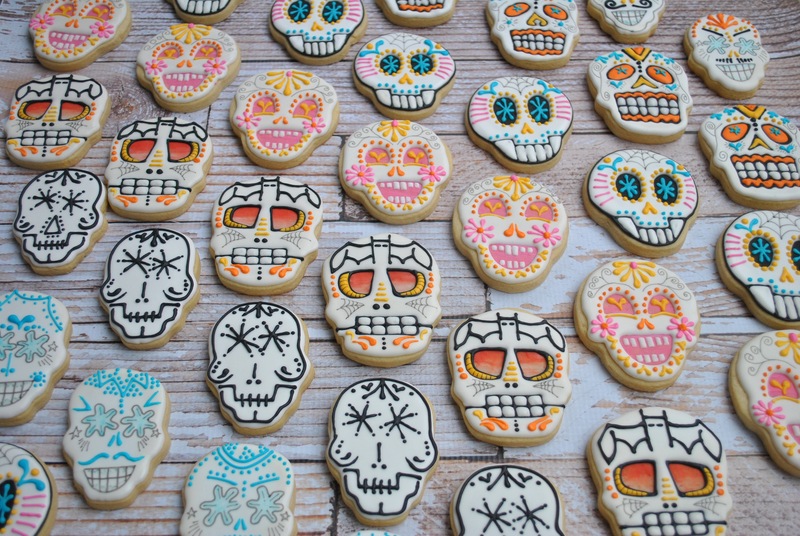 My favorite celebratory ritual of this Mexican holiday is the exchange of the sugar skull. 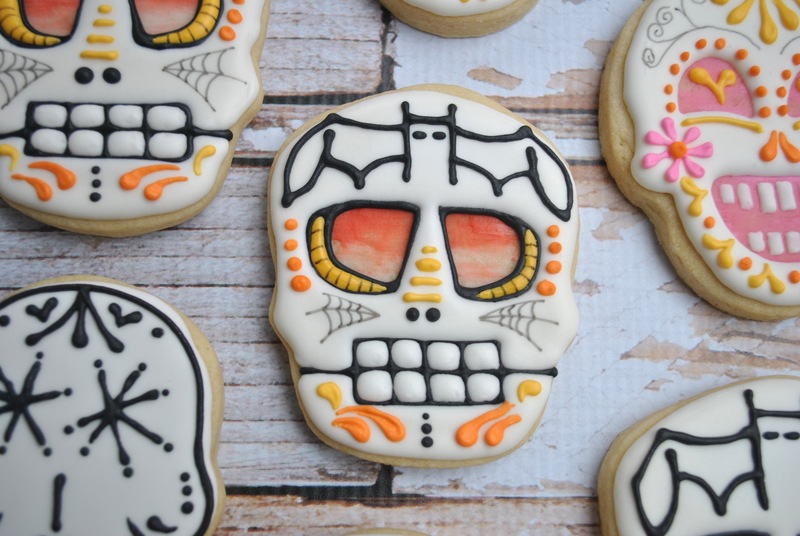 Which brings me to my next set of cookies… Here are my designs to honor that occasion. Special thanks to IG fellow cookier Kelly, Minisugarrush, for the “bat inspiration”. I sketched out my ideas for the skull designs to begin the process. 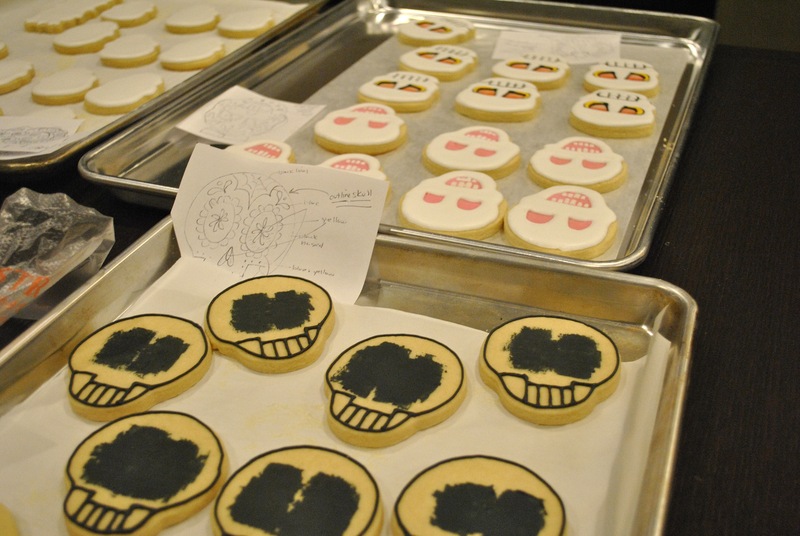 To create the depth for the eyes in some of the designs, I painted a thin layer of the royal icing on the cookie base. For the red bat skull, I blended red and white. 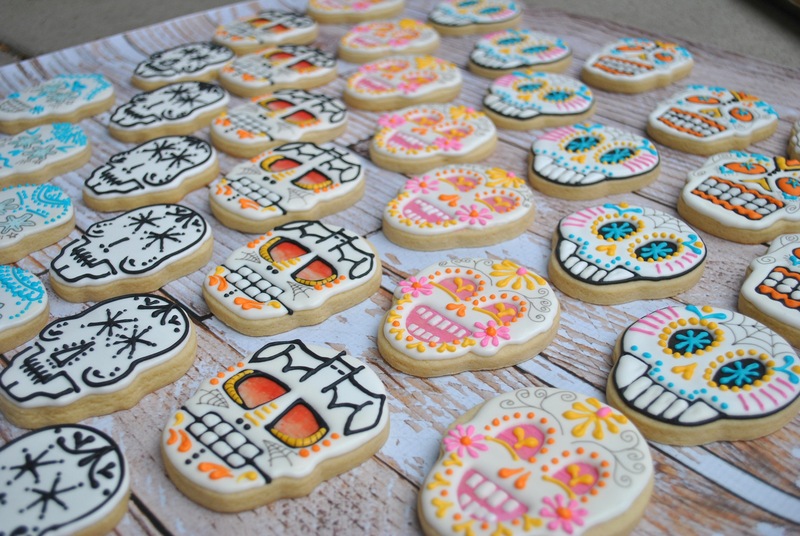 The sugar skulls plated. 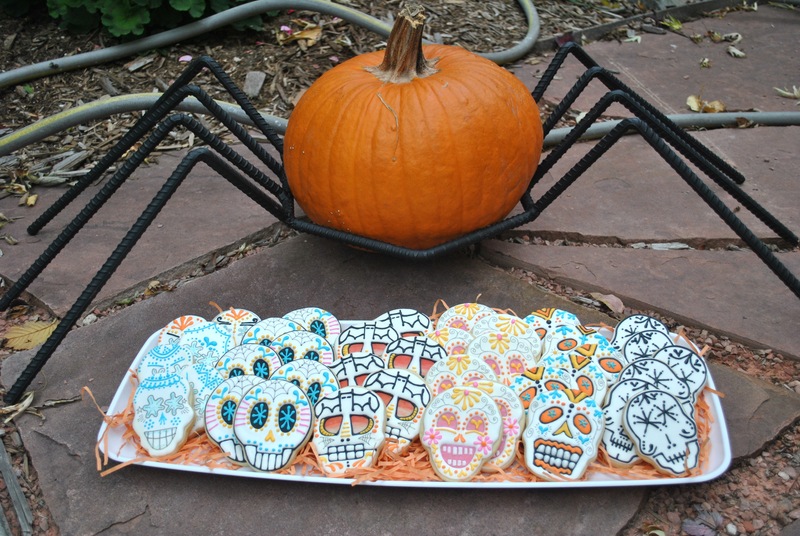 Isn’t this spider base for the pumpkin the coolest? My niece’s husband created several for me a few years back. Cool to have a blacksmith in the family. Lost art.